One of the first tests that should be done on any pinball machine that is new to you or that is having issues is that you test each of the coils and any with low resistance should be replaced. The flipper coils take a lot of wear and tear and are usually the first to fail, even though they have a failsafe of sorts built in to them. If you press the flipper button the driver board activates a small transistor which steps up to fire a bigger transistor which then sends 30 volts to the flipper coil and forces the metal piston out which moves the flipper. If you hold the flipper button in, the current would normally continue to flow to keep the piston in place which keeps the flipper in the up position. If you do this for too long, the flipper coil would get hot, fail and could well take out a couple of transistors on the driver board with it. What happens instead is that when the flipper button is pressed, the flipper moves up and at the full extent of its stroke the mechanism hits an �end of stroke switch� which cuts the 30volts and instead switches it to 6 volts. That 6 volts is high enough to hold the flipper where it is but low enough to not overheat the coil, and the flipper can safely be held in this position without damaging the driver board or shortening the life of the solenoid too much. 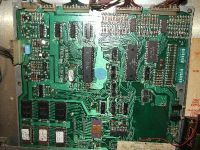 Once I�d tested the Power Supply and all of the coils, I began to work on the CPU and driver board. 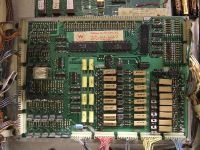 The CPU board contains the microprocessor which in a Williams game of the era was a Motorola 6800/6802 series. 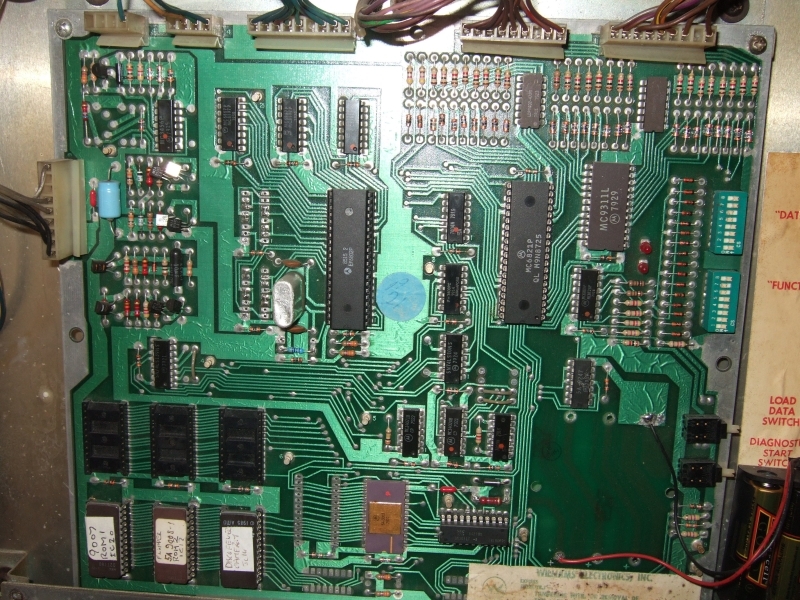 The CPU board also contains the actual game ROMs (the chips that contain the game program and data). Another thing on the board that really should not be, and should actually be relocated is the batteries and their battery holder. The original board design was to have the batteries in a holder on the CPU board, but batteries can leak, and if they do they leak corrosive material over the CPU and driver board. Not only that but the corrosive fumes from the batteries can also corrode the ROM sockets and the 40 pin connector strip between the boards. This damage is not always obvious so it�s a good idea to just do this modification anyway and put them elsewhere in the back box and simply run wires back to the original connectors. Luckily this mod had already been done on my CPU board so I didn�t have to do it myself. A final thing to check with the batteries is the diode D17. Diodes allow current to flow one way and not the other so this diode has a couple of functions. It allows the batteries to power the 5101 RAM chip when the game is off and not the whole CPU board. It also stops the 5 volt supply from trying to charge the batteries when the game is on. If this happens then the batteries will almost certainly leak. This diode is a common point of failure and in my machine it had blown so I replaced it. As a check to see if it is blown or not you should test the voltage on each side of it. On the non-banded side the battery voltage should be about 4.5 volts and on the banded side it should be about .5 volt less. If there is no voltage on the banded side but there is voltage on the non-banded side the diode is at fault. If there is no voltage on the non-banded side then the batteries or the battery holder is at fault. Ultimately the power from the batteries goes to pin 22 of the 5101 RAM chip so you can also test the voltage at this pin, but bear in mind that this RAM chip is also a notoriously bad chip and will fail often so you will need to test it, probably using the built in diagnostic LEDs on the CPU board, but you have to get the game booted into audit mode or attract mode to do that, and I wasn�t ready for that yet, but basically booting into audit mode and pressing the lower diagnostic button on the CPU board with the coin door open will illuminate both LEDs if the 5101 is dead, and indeed mine would turn out to be dead too. Like I said, the driver board is really an extension of the CPU board and they can be treated pretty much as one unit. 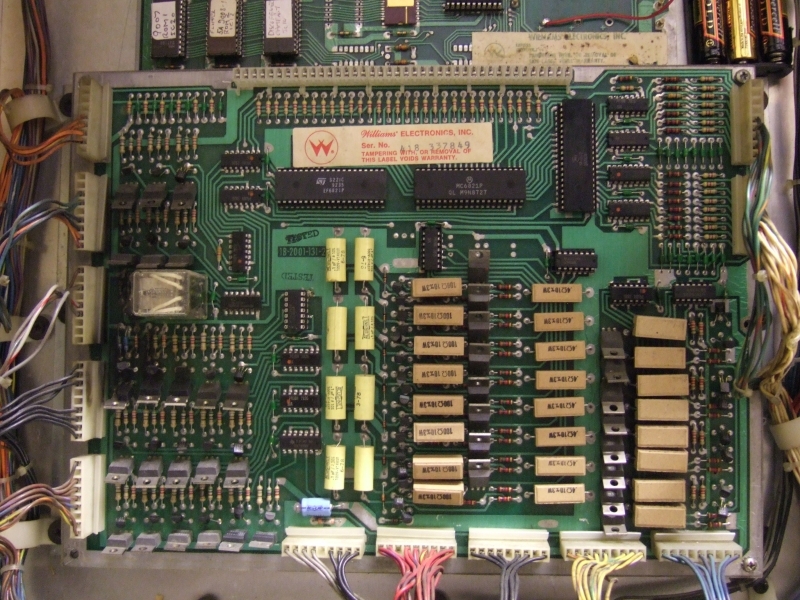 The driver board controls the solenoids, lamps and switches, and the CPU board with its 6802 microprocessor controls the rest of the game through a series of PIAs (Peripheral Interface Adapter). The PIAs have addresses like RAM or ROM chips do and the game ROMs access them to see what is currently happening in the game and what solenoids are firing etc and will do things like update the scores when targets are hit. On System 3 games like mine there are four PIAs, one on the CPU board controls the score displays and the other three are on the driver board. One controls the solenoids, one controls the lamps and one reads the switches. If a PIA fails and is not readable then the game will lock up and will not work. That�s another reason why the two boards can be treated as one, because the CPU board cannot "boot" without the driver board attached. Not normally anyway but there are special ROMs that you can use to test them separately. One of the most common failures of these boards is the connector strip that joins them together, and it�s reported that they can fail after as few as twenty five cycles, that is, removing and reattaching the driver board twenty five times, so I checked all of the pins and pin joints and reflowed the solder on a few of them that appeared to have slightly dry or cracked solder joints so that I got as good a connection as possible. Then I could focus on the boards themselves. 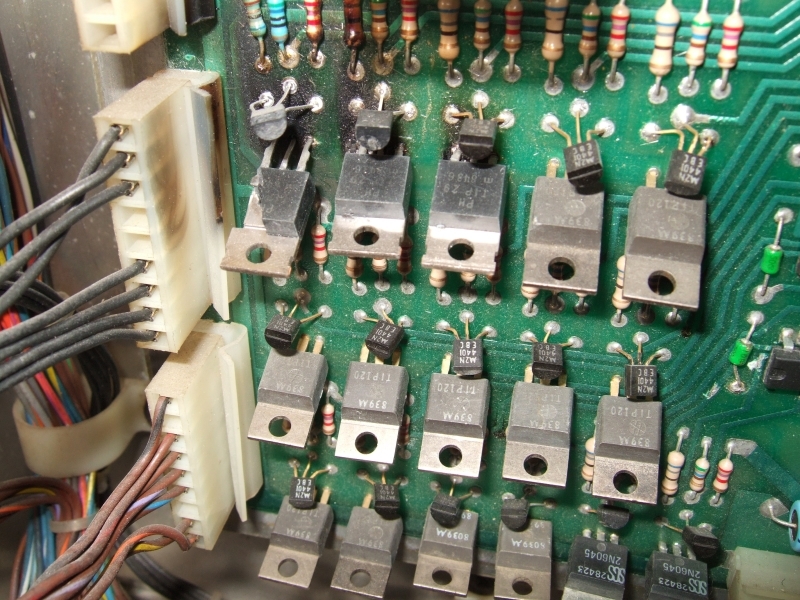 The most obvious thing about my driver board was that there were some heat damaged areas and it had plainly been very hot at some point, and probably over a period of time, as there was the traditional blackening of the connectors for the G.I. circuit, so all of those transistors in that area, and in fact beyond would need testing. 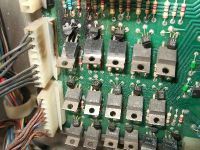 Parts of the driver board are made up of pairs of transistors that drive the solenoids located around the playfield, the transistor pairs are made up of a TIP120 and what�s referred to as a pre-driver transistor, a 2N4401. The lamps are driven by a different transistor, a TIP42 paired with a pre-driver 2N6122. It�s possible to test them with a multi meter but it is not always 100% accurate. If any of the TIP120s are found to be faulty, and some of mine were (in fact quite a lot of mine were) particularly in that heat damaged area, it�s best to replace them with a more modern TIP102 which does the same job but under much less stress and will tend to last longer. All of these transistors are driven by a 7408 chip, and you can also test those chips because sometimes a transistor being tested in circuit can test as bad while it is good, which means that the relevant 7408 chip is bad, so it�s important to test each part of the circuit in the right order, and only move on when you are happy that the previous components are good.